Ive tried several ways and even tried a couple of tuts, but cant seem to get the TS animations converted over to my new RA2 Anim2.pal which is the TS anim pallette renamed and inserted into RA2. RA2 and shp builder read the palette fine but just wont let me convert it.It works fine when converting icons, so I dont know any suggestions? Do you know the colour replacement tool? 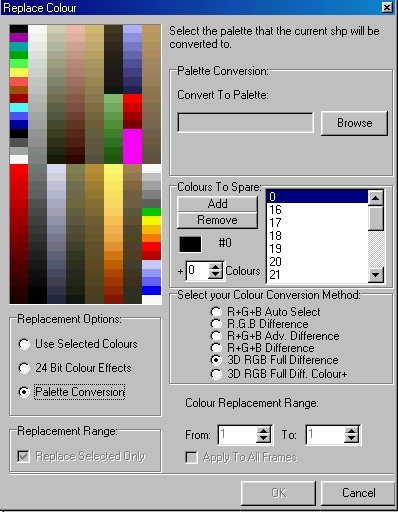 There is an option to convert from one palette to another there. Check the help file that comes with the program for more information. @Crevio: what are you trying to do? it makes no sense for me. 1. if you made a copy of the TS Anim.pal, renamed it to Anim2.pal and inserted it in RA2 , why should RA2 read this? The palettes and their usage from the game is hardcoded. 2. assuming RA2 would read your Anim2.pal and you found an art.ini key to assign this palette to a certain anim (i doubt that such a key exists), why do you want to convert your TS anims? If Anim2.pal and Anim.pal are the same, there is no need for a conversion as the colors are still the same. 3. This is the way how i convert stuff. Open XCC Mixer, extract all frames of the anim using the correct palette into a sequence of PNG images. Change the palette in XCC Mixer to the new one. Select the sequence of images and convert them back into an SHP. voila 3 small steps which don't take longer than 10 seconds. I'm talking about the palette conversion at the Colour replacement tool that is even better than what XCC Mixer does (it converts colours better and ignores strategic colours). Here's the screenshot of the feature from the help file. You can reach it in the colour replacement feature of the program.